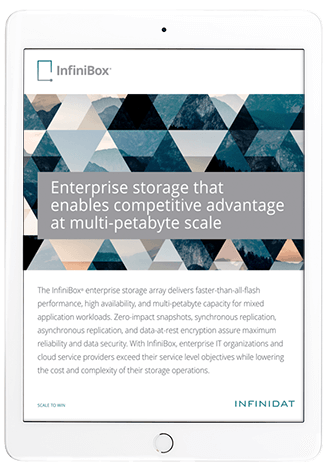 The InfiniBox® enterprise storage system delivers faster than all-flash performance, hyperscale capacity, and bulletproof reliability, built for the most demanding workloads in enterprise data centers. Infinite zero-impact snapshots, dependable synchronous and asynchronous replication, and flexible, software-defined quality of service come standard, with guaranteed reliability and data security. 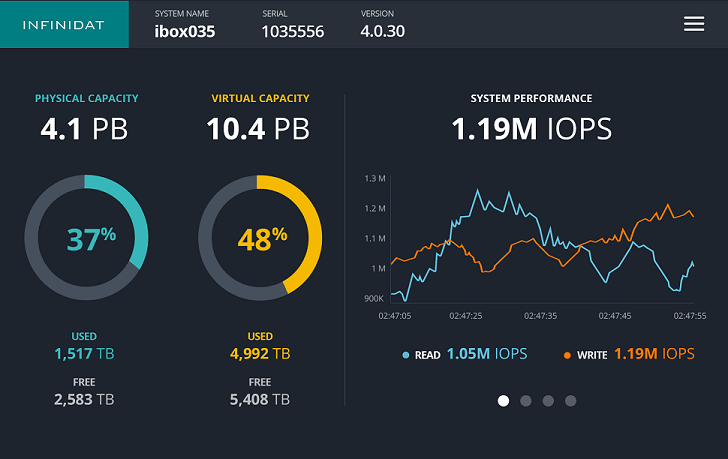 With InfiniBox, enterprise IT organizations and managed service providers are able to exceed their service level objectives while radically lowering the cost and complexity of their storage operations. Download the InfiniBox data sheet to learn more. Infinidat customers routinely consolidate entire rows of legacy enterprise storage onto a single InfiniBox system, leading to 10:1 reductions in both floor tiles and network port costs. 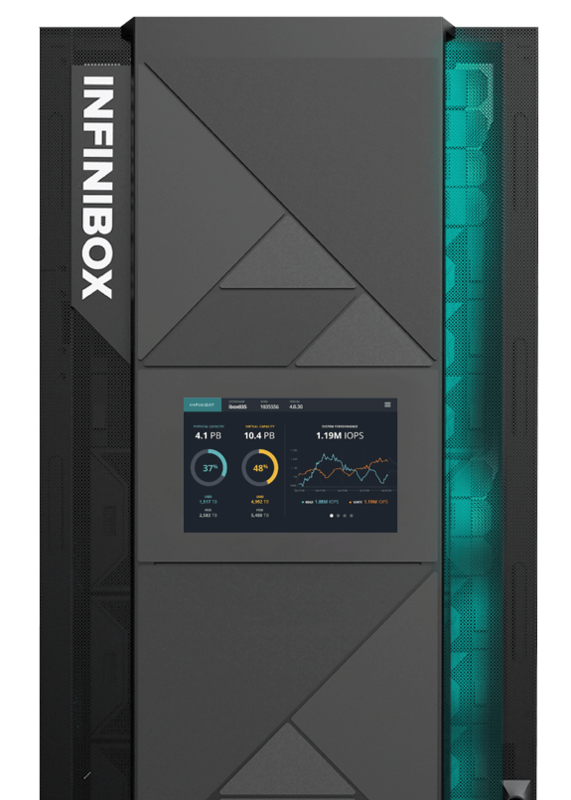 InfiniBox eliminates storage array and filer sprawl, allowing operations and capacity planning teams to leverage the economies of scale of unified data center-scale pools of storage. 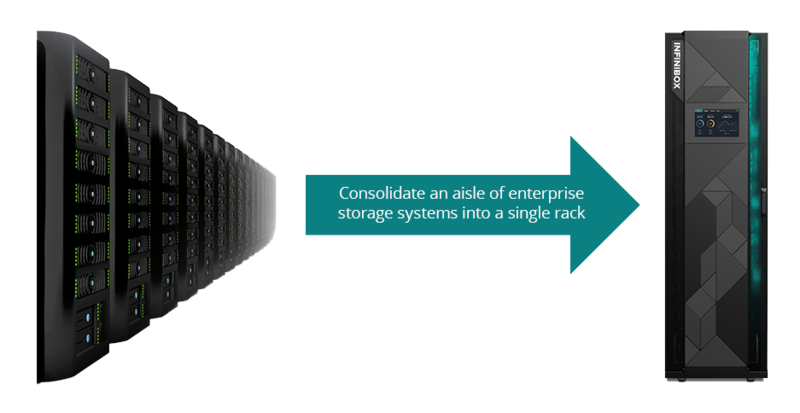 Flexible, software-defined quality of service and mainframe-class reliability ensure that mission critical line-of-business applications run nonstop alongside development and test workloads on a secure, scalable, efficient storage infrastructure. The heart of every InfiniBox is Neural Cache, a machine learning algorithm that maintains a connected history of every data section the system has received since inception. By observing all network traffic to the storage system, Neural Cache uses the I/O history to recognize correlations in data access patterns and immediately begins predicting future I/O requests, which are preemptively staged in cache. Because most I/O requests are served directly from RAM (which is more than 100x lower latency than flash), InfiniBox customers can expect higher application performance from virtually any enterprise workload versus what traditional all-flash arrays can deliver. Sub-millisecond access across multi-petabyte data sets enables breakthrough acceleration of digital transformation use cases in every industry, ranging from genomics and precision medicine, to autonomous vehicle training and VR gaming, to core banking and fraud detection. Download the whitepaper to learn more about how Neural Cache adapts, learns, and accelerates real world customer workloads. From the earliest InfiniBox installations dedicated to core banking workloads in the US, to the current global footprint that supports life-, safety-, and mission-critical customer workloads on six continents and in every industry we serve, Infinidat has earned an unprecedented reputation for product quality and reliability from a customer community that has zero tolerance for downtime. Every system is designed for zero downtime over the course of its entire lifecycle, and every deployment is eligible for a service-level agreement ranging from seven nines (3.16 seconds of downtime per year) to 100% data availability (zero seconds of downtime per year). InfiniBox’s unprecedented reliability begins with hardware and software redundancy. Every single component in the data path is N+2 redundant. In addition, our team operates the largest and most sophisticated storage QA lab in the world (over 150 PB). Customers rest easy knowing that every component of every system passes through an exhaustive integration, verification, and test process prior to arrival on their data center floor, and their storage will run for its entire installed lifetime without interruption. Download the data sheet to learn more. There’s a reason CIOs and Procurement Officers love Infinidat. Our customers experience a step function reduction in both CapEx and OpEx when they migrate from legacy all-flash arrays or hybrid disk systems to InfiniBox, while simultaneously improving application performance and reliability. InfiniBox makes IT organizations more agile with Capacity on Demand. With COD, customers can purchase base capacity on day one, and grow into full system capacity over time. 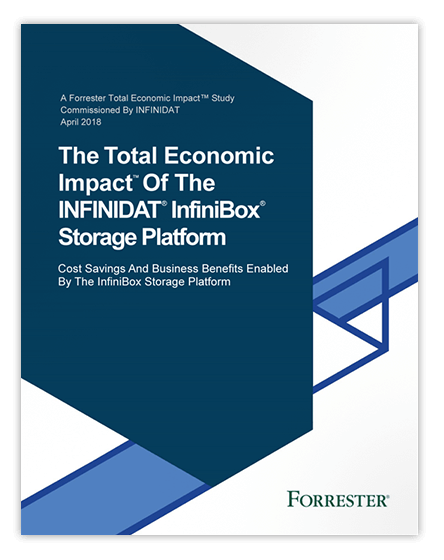 Read the Forrester Total Economic Impact Report to learn how Infinidat customers save an average of $18.4 million and achieve payback in less than six months. Unlike traditional “unified” storage, which is an open source file system bolted onto a block array, InfiniBox was built from the ground up to deliver petabyte-scale NAS and SAN in parallel. The Infinidat File System (IFS) is a first-level peer to the block service, and is a clean-sheet design that employs a stateless, functional programming paradigm to deliver petabyte-scale NAS services that couple directly with Neural Cache. Along with conventional NAS workloads, InfiniBox excels at extreme use cases, such as trillions of objects in a file system and millions of files per directory, which are simply not possible with traditional NAS filers. The InfiniBox ecosystem provides seamless integration with leading IT applications and platforms, including relational databases, analytics, hypervisors, and containerization platforms. From Oracle to Splunk and VMWare to Kuburnetes, InfiniBox includes the integrations customers need to build modern data center solution architectures. For more information on the InfiniBox ecosystem, check out code.infinidat.com and our Technology Alliance Partners. 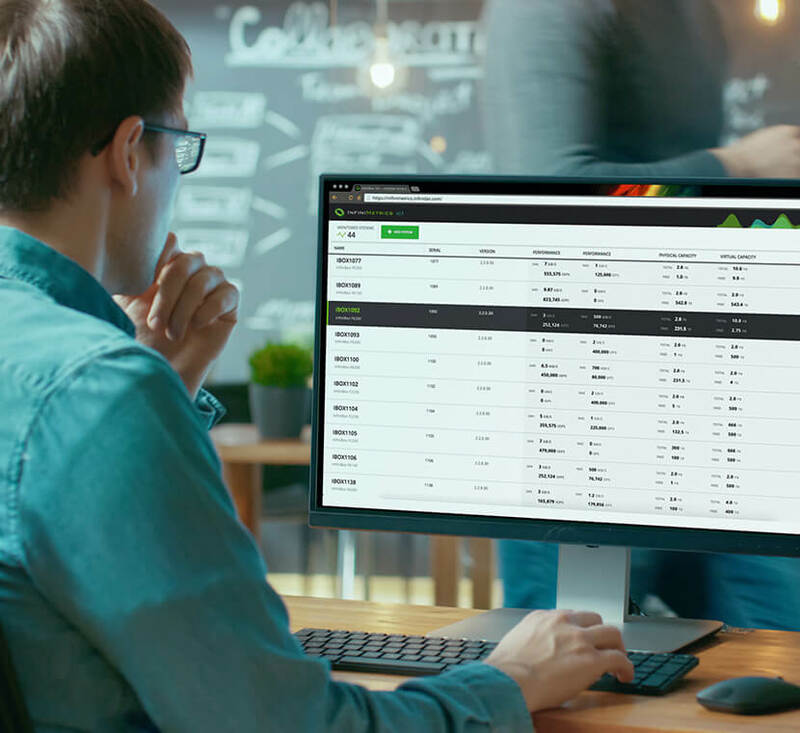 The front end of InfiniBox’s control plane is a consumer-grade GUI that presents every storage function, from provisioning to performance analytics to security, in an intuitive user-centric view. Behind the scenes, the GUI and CLI are in fact just thin, stateless clients that consume InfiniBox’s REST API. InfiniBox includes robust SDKs for Python and Java, enabling easy integration with data center provisioning and monitoring environments. Best of all, programming against our API is fun. Of course you can read the docs to learn syntax, but you can also turn on the API monitor and simply watch the actual REST calls and responses generated while using the GUI. If you can do it in the GUI, you can cut and paste it into a DevOps script. Like what you see? Download the data sheet or Schedule a Demo.